This game is based off of “Don’t Eat Pete,” a game I learned at a friend’s house when I was little. I know several people play it for family night. When I told Josh about it, he thought I was nuts (he had never heard of Don’t Eat Pete). Which just made me want to have our kids play it more! 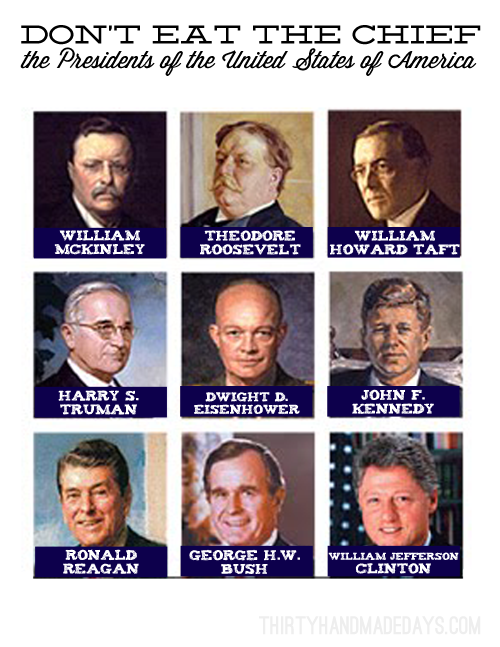 I created several printable cards that have all the Presidents of the United States with their names on them. 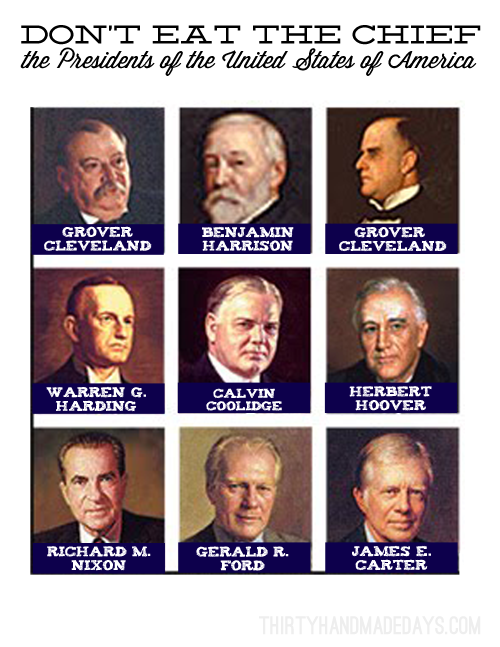 There are two presidents that are repeated to make the cards even. 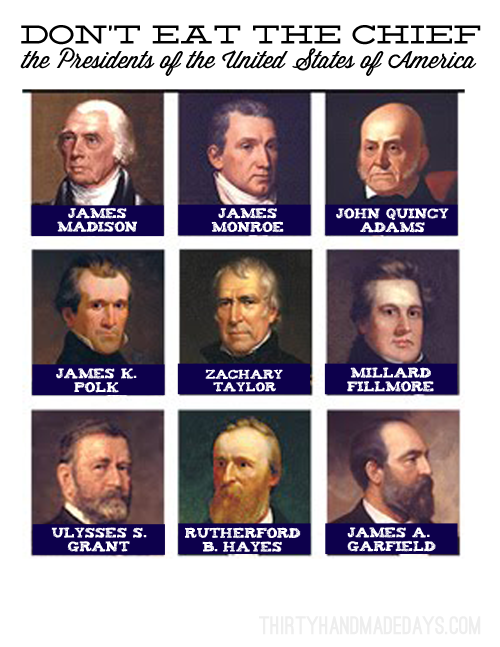 My hope is that they will get more familiar with the presidents of our country. This could be taken several steps further with studying each one individually. For now, let the games begin! 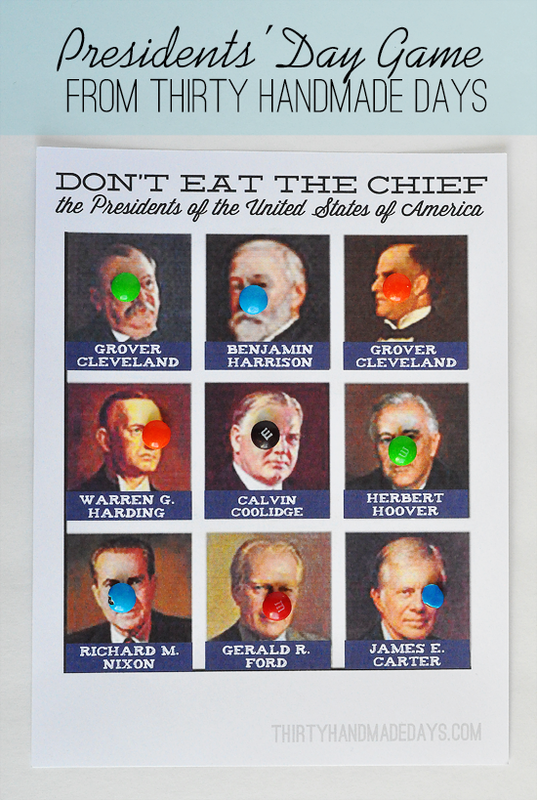 Object of the game: Eat as many small candies (cereal pieces/whatever you want to use) as you can, but don’t eat the Chief! Directions: Place one small candy (or cereal or whatever you want to use) on each of the nine squares. Select a person to be the “candy monster” and send him/her out of the room. 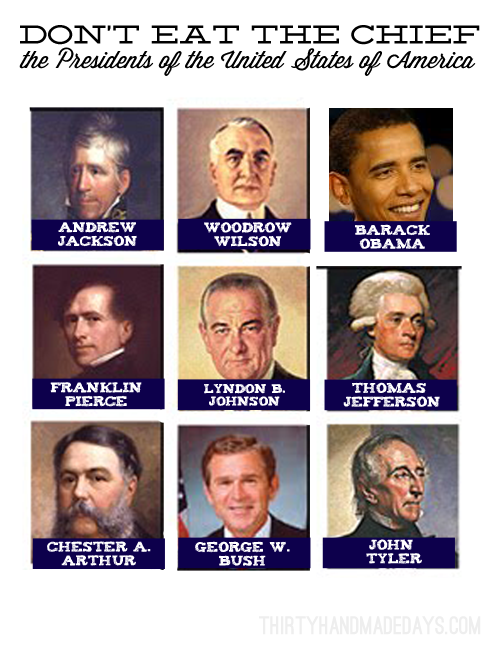 The remaining players then select one square to be “the Chief”. When the “monster” returns, he eats the small candies one at a time but as soon as s/he touches “the Chief” the group yells “Don’t Eat the Chief!” His/her turn is over and another person is selected to be the candy monster. Play continues until all have had a turn. for personal use only. They are offered as is. Thanks! 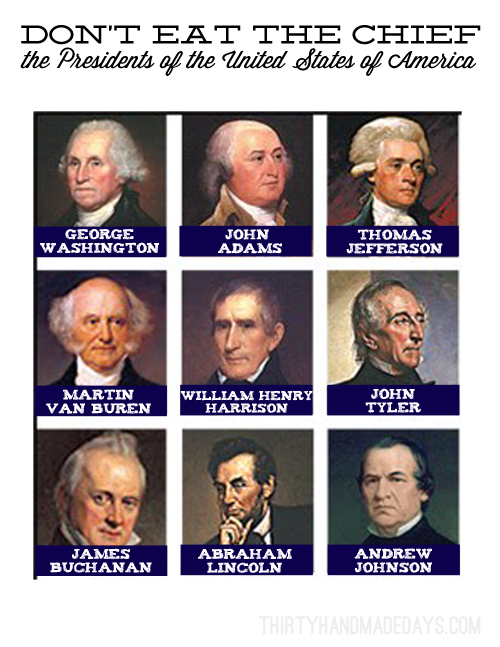 What do you do to celebrate Presidents day? When I print them off it just rolls out a blank piece of paper….help, what am I doing wrong? THANKS!!!! 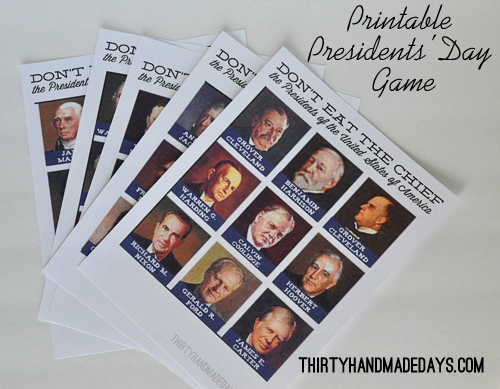 We just started studying the presidents this week and I’m super excited to use this game to review them! How cute! I just posted last week about the Don’t Eat Pete game we played at my daughter’s birthday party :) I love this twist! That is a great idea Chris! I’ll have to try that as well. Thanks! Yay! Glad you like it Laurie- thanks!